The Accept360 Spring 2011 release introduces a set of new capabilities to enhance collaboration with internal and external stakeholders, while bolstering Agile tools for productivity, resource management, and integration with popular third-party enterprise applications. * Advanced resource management capabilities help executives and product decision makers make better, faster decisions about their product investments and resources by allowing users to define organizational reporting structures and hierarchies for both individuals and teams to optimize resource allocation and focus them on the highest priorities. * Improved Agile features deliver real-time operational planning for fast-paced resource optimization and capacity planning. * Integration with Tasktop provides users with direct access to Accept360 through Eclipse or Visual Studio environments providing unparalleled project management capabilities and enabling developers to take advantage of Accept360’s single source of truth for development tasks with the familiar look and feel of their favorite development tools. * Integration with Oracle® CRM On Demand extends open innovation initiatives to one of the most popular platforms for managing customer relationships. 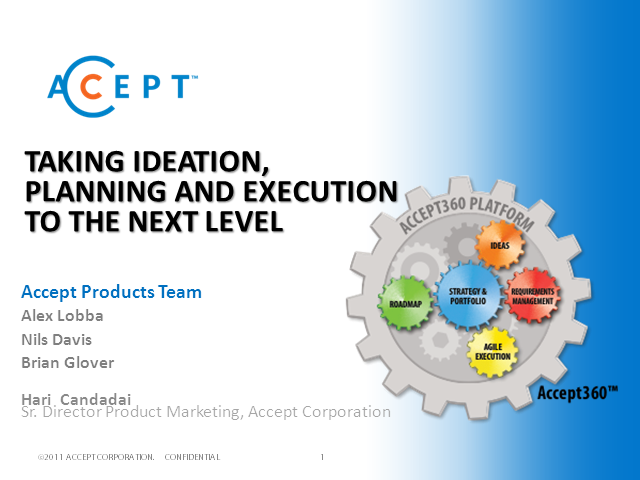 The integration of the Accept360 Ideas module transforms Oracle On Demand CRM into a community-based, social CRM system that improves a company’s ability to capture and streamline customer feedback on its products.